The Federal Government is prepared to explore all options, including accepting unconditional renunciation of violence by insurgents to end the wave of terrorist attacks in the country. This indication was given by President Goodluck Jonathan in his Democracy Day broadcast on Thursday. He, however, said that all security measures are also being pursued. The president assured that the insurgents would be de-radicalised, rehabilitated and re-integrated into the broader society. He said: “For our citizens who have joined hands with Al Qaeda and international terrorists in the misguided belief that violence can possibly solve their problems, our doors remain open to them for dialogue and reconciliation, if they renounce terrorism and embrace peace. “We must remain united to win the war against terrorism. Christians, Moslems, farmers, fishermen, herdsmen, teachers, lawyers, clergy or clerics, the rich, the poor and Nigerians from all sections of the country must work together with our security agencies and armed forces to overcome the terrorists who now threaten all that we hold dear. “The war against terror may be difficult, but the days of peace will come again. Terror is evil; nowhere in history has evil endured forever. 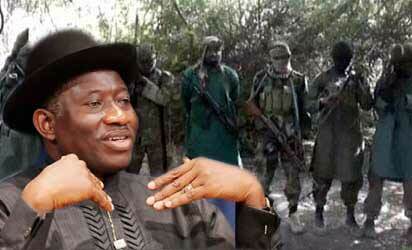 The menace of Boko Haram will surely come to an end. I believe that because of your prayers, your courage, hardwork, faith and sacrifice, we will ultimately prevail over the terrorists and all other evil forces”. Mr. President also restated the Federal Government’s resolve to partner with the civilized world to confront international terrorism and every other challenges with patriotic zeal and determination. President Jonathan stressed that he had granted all lawful powers to the security forces towards stamping out insurgency in the country. While commending security operatives in the country for the successes recorded so far in the campaign against terrorism, the president recalled the gallant efforts of the Nigerian Armed Forces in peace-keeping operations abroad and urged them not to relent in the battle ahead. ”We must not forget their gallantry and successes in liberating nations and in peacekeeping, from Liberia to Sierra Leone, Congo, Sudan, Mali, Guinea-Bissau and many places in Africa and beyond. Our forces have paid the supreme price in several places at several times”.